I found the whole experiene of dental implants much less daunting than I expected and the outcome entirely satisfactory and I have no hesitation in recommending Dental fx. Dental implants are now considered the number one option for patients who want to replace their missing or failing teeth. At Dental FX in Bearsden, Glasgow, our implant work is carried out by renowned implant dentist Dr Stephen Jacobs. Dr Jacobs is recognised as one of the leading clinicians in implantology. He also runs training courses for other dentists interested in introducing dental implants to their practice. Dental implants are a 21st-century treatment option for patients with lost or failing teeth. They have a high success rate (up to 98%) and produce long-lasting, effective results. With proper care, your implants could last you a lifetime. Implants are small titanium posts that your dentist places directly in your jaw bone in a minor surgical procedure. Here they integrate with the bone, acting as replacement tooth roots. After a healing period, replacement teeth in the form of crowns, dentures or bridges are attached on top. If you are interested in treatment with dental implants, your first step should be to book a consultation at our Glasgow implant practice (or ask your dentist to refer you). 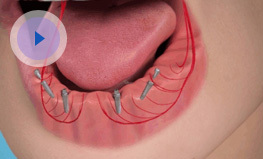 The good news is that most people are suitable for implant treatment these days, thanks to advances in techniques and materials. Dr Jacobs is experienced in treating even complex implants cases. We use a cone beam CT scanner to assist with the placement of implants. This generates a 3D scan to enable your dentist to place your implants precisely. At the impression stage of your treatment we also have a specialised scanner which does away with the need for taking impressions of your mouth, making the experience much more pleasant for patients. Your implants will be carefully placed in your jaw bone and left to heal. This usually takes a couple of months. After healing is complete and your implants have fused with your bone, your realistic-looking and acting new teeth will be attached. Patients who have worn dentures for some time and have experienced bone loss may need a bone grafting procedure before implant treatment – this can be carried out here at our Glasgow dental practice.